Summer is almost here and so is a giant lineup of concerts in the Metro Vancouver area. 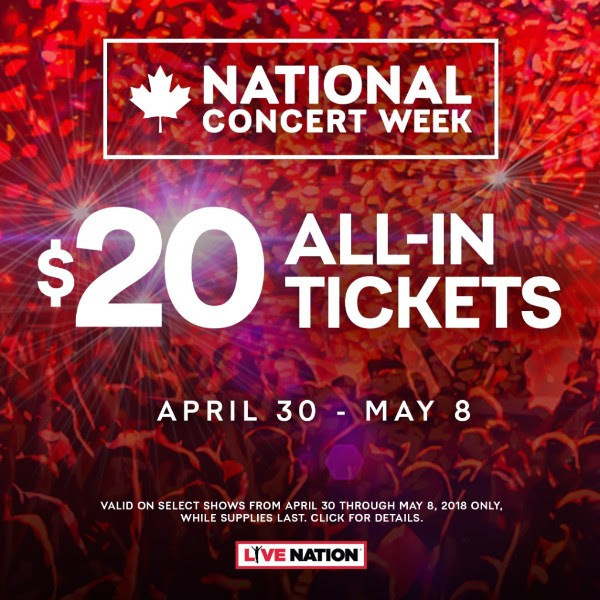 Live Nation has just launched National Concert Week with a $20 ticket offer for over 150 shows across Canada! For one week only, fans can get their hands on the $20 all-in tickets beginning Monday, April 30 at 8:00am local time the Live Nation website, through Tuesday, May 8 at 11:59pm local time. For a full list of artists, visit the National Concert Week website, click on the show, and select “$20 tickets” – April 30 to May 8 only! Do you know which of these are Vancouver concerts? @Diane – I have been told that the specific concerts/artists will be revealed on April 30th when the ticket purchasing goes live.